Presenting the Gospel, the good news of Jesus Christ's death, burial, and resurrection is at once the most precious privilege and also the most daunting responsibility that faces every believer. I grant you that there are some believers, usually with the gift of evangelism, that have no problem sharing God's greatest gift with others. However, for most believers, the very thought of even gently confronting a possible unbeliever with his or her need of Christ brings fear and trembling and so, unfortunately, many believers avoid presenting the Gospel altogether. 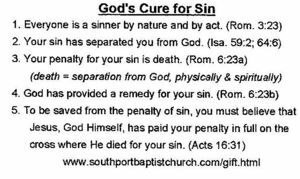 Incidentally, if you're not sure about your standing with the Holy God of the universe, click on "Free Gift" above and read it carefully before you go any further on this page. However, if you are a true believer and really want to be obedient in this crucial area, the tips on this page may be just what you need and for which you may have even been praying. Tip # 1 - Presenting the Gospel doesn't mean you have to lead a person to faith in Christ. Actually, that is the Holy Spirit's job. He may give you the incomparable joy of being His tool for leading someone to faith in Christ, but all you are responsible for is sharing the "how" or even just offering to share the "how." Tip # 2 - Never use the phrase, "Good News" unless you have just recently met the one with whom you are trying to share it, or are willing to apologize for your gross negligence to anyone you've known for any length of time. Tip # 3 - Many believers would be willing and are able to share the plan of salvation. However, they don't have a clue when it comes to leading a conversation to the place where the plan of salvation is a natural result. Below are seven conversational, non-threatening questions that you can use for this purpose. Start with the first one and proceed to the last, not responding to their answers. Show genuine interest in the responses but don't argue with the answers. This is what Jesus meant in Matthew 4:19 when He said, "Follow Me and I will make you fishers of men." Incidentally, someone has wisely remarked, "If you aren't fishing you aren't following." 1. "What sort of spiritual background do you have?" 2. "What are your spiritual beliefs now?" 3. "What is your concept of heaven and hell?" 4. "Who is Jesus to you?" 5. "If you were to die, right now, where would you go?" sure that you would go to heaven?" 7. "Would you be willing to let me to do that for you right now?" has paid your penalty in full on the cross where He died for your sin. If anywhere along the way, your friend has genuine questions and wants to spend some quality time with you, click on "Gift" above and read it prayerfully and carefully together. Don't hesitate to contact Pastors Jones or Schlagel at any time. 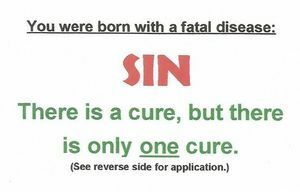 Ask this one question: "If you learned that you were born with a fatal disease, then someone offered you the cure, would you accept it?" If they say "Yes," hand them the card shown below or any other good gospel tract. If they say "No," lay the tract on the table or counter and say, "I'll leave this with you in case you change your mind." You could print these on business card stock and then laminate them for durability. Keep some in your New Testament or your wallet for quick and easy access.